Religious paintings, soft lighting, clean and cosy environment are not the only recognitions of international Govinda’s Restaurant in Al Karama locality of Dubai. As, this bistro is well known for preparing 100 percent pure vegetarian food, which is a rare commodity and hard to hit upon outside India. The dishes at this restaurant are cooked by putting in fresh ingredients and following creative recipes, which produce majestic flavours, which is hard to find elsewhere in this city. Apart from main course vegetarian dishes, Govinda’s Restaurant also offers 100 percent vegetarian ice cream, Tru Frut, which is available in different flavours. 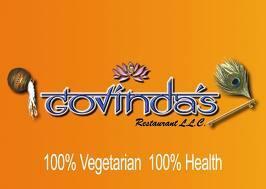 In short, this eating place is providing high quality and delicious food to veg food lovers at reasonable rates. Govinda’s Restaurant serves traditional Indian vegetable dishes, which its chefs make from handpicked herbs and innovative recipes. It is because of this unique concept that Govinda’s Restaurant has been able to inspire several people in Dubai, who used to believe that vegetarian food is quite boring. They also serve an ice cream, which is completely natural and vegetarian. It is called Tru Frut and it is available in various natural flavours for instance litchi, fig, mango, apple, chickoo, kaju, coconut, dates, vanilla, strawberry and choco chip. Visitors will also get sugar free ice cream in these flavours from this restaurant. The restaurant also pays a lot of attention on its service therefore staff members are trained well before starting their duty, so guests will leave this venue fully satisfied. From Saturday to Thursday lunch timings of this eatery are noon - 3:00 pm and dinner on the other hand is served between 7:00 pm and midnight. On Fridays, lunch can be savoured between 1:30 pm and 3:00 pm, while dinner can be consumed between 7:00 pm and midnight. 4 A Street - Dubai - United Arab Emirates. Khalid Bin Al Waleed Metro Station 1 is located at 11 minutes walking distance from Govinda’s Restaurant, as it just 850 metres away. So commuters can easily get to this bistro from Khalid Bin Al Waleed Metro Station 1, if they head in the south course towards Sheikh Khalifa Bin Zayed Street/D 88, then turn slight left onto Khalid Bin Al Waleed Road/D 79, before making a right turn towards 1st Street, after which patrons should turn right onto 1st Street and then turn left onto 4 A Street in order to locate the destination on the right side. 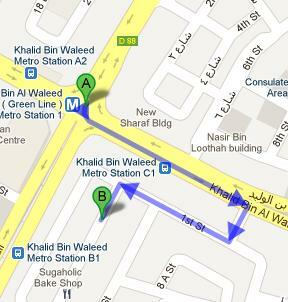 Khalid Bin Waleed Metro Station B1 – Dubai bus stop is 600 metres away from Govinda’s Restaurant. Visitors can bridge this gap on feet in about 7 minutes, if they head southwest on Sheikh Khalifa Bin Zayed St/D 88, after reaching this bus station and then turn left onto 11th Street. Afterwards they should turn left onto 4 A Street from where destination is not too far and can be spotted on the left side. Visitors can use any of these bus numbers 21, 29, 33, 42, 44, 61, C5 and C10 to reach this bus top. See map for directions.